We’ve got good news for those who have been lying in wait for Pakistani film Yalghaar to release. The official release date is out and it’s December 25th of this year! Ever since ARY Films’ Waar took the whole nation by storm and satiated the local audience’s desire for a local film to entertain them, it seems that another similar film is back to fulfill the purpose. And that film contains Shaan Shahid as well, and its name isYalghaar. However, Yalghaar will have its work cut out for it, when it takes on Bollywood heavyweights at the box office. Around the same time as Yalghaar graces theatres, audiences are expected to flock to the cinemas to witness Shah Rukh-Kajol’s Dilwale and Deepika-Ranveer’s period drama flick Bajirao Mastani. 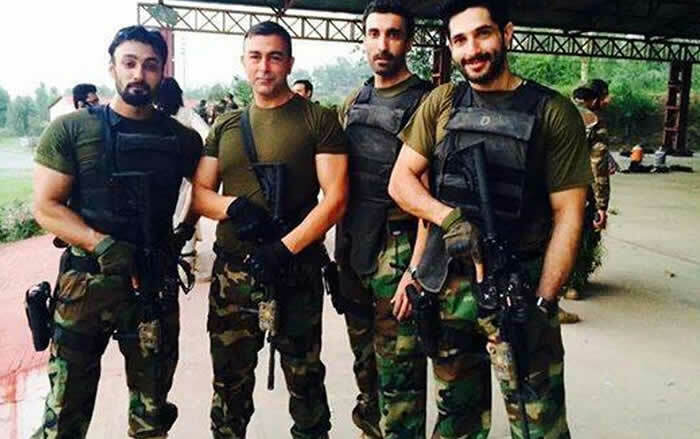 Yalghaar looks to impress, as a couple of BTS video clips have been circulating the internet and have fueled intrigue, way ahead of the movie’s release. Starring Shaan Shahid, Ayub Khosa, Ayesha Omar, Uzma Khan, Humayun Saeed, Umair Jaswal and Adnan Siddiqui, the movie is all set to set our screens ablaze with an ensemble cast and plenty of talent. According to local reports, Yalghaar focuses on Pakistan Army’s Swat Operation and the bravado of the soldiers involved in carrying out the operations. The movie also deals with the effects these operations have on the personal lives of Pakistani soldiers. Yalghaar will also be facing local competition in the form of ARY Films’ Ho Mann Jahaan which will release on 1st January 2015.Ho Mann Jahaan stars Mahira Khan in the lead.